- You’ll get this quest randomly after you start completing Minutemen tasks for Preston. 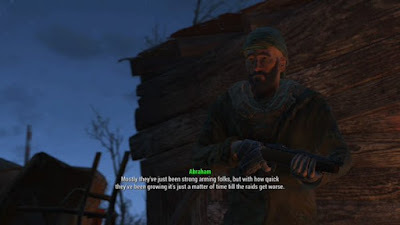 All you need do is set him up in Sanctuary (or elsewhere) and visit him occasionally until he drops the quest. It shouldn’t take too long. - Your destination is the Finch Farm, located on the astern seaboard of the Commonwealth. There territory you need to cross from Sanctuary isn’t terribly dangerous, particularly if you stick to the woods along the way, though things will get a bit hairy if you decide to stray into ruined buildings. - Speak to Abraham, the dude who runs the Finch Farm. He wants you to retrieve a sword that was ‘stolen’ from him by a group of Raiders. They reside in the Saugus Ironworks, a short jaunt north of the Farm. He also mentions his son, Jake, who took the sword to them in the first place. You have the option to take Jake back while you’re there; we’ll get to this in a bit. One of the Forged of Saugus Ironworks. I think he wanted a hug. - The factory is easily within sight of the Farm, and approaching from the rear will keep you out of trouble, because its occupants - who are actually called Forged, not plain ‘ol Raiders - are camped out on the north side. There’s not much to see in the immediate vicinity, besides Hub City Auto Wreckers in the east, The Slog in the north, and some radioactive barrels in the south, so you won’t need to canvas the area too much. - There is not, unfortunately, a back way in. (Aside from a trapped door on the west side of the Ironworks, I guess, and when you open it a Flamer will try to cook you.) The Ironworks is focused up front, and the front is watched by the Forged, who combine long-range guns with short-range melee weapons and some heavy armour. On the whole they’re pretty powerful, and you don’t want to face them in a big brawl. Either snipe them from afar or pull them into the woods where you can more effectively divide and conquer. Regardless of how you get past, the door is at the front of the Ironworks. - Once you’re indoors you’ll be facing even worse conditions. The Forged in here have the same weapons, but melee and Flamers are far more dangerous in close quarters as there are fewer places to run away. Be prepared to deal with multiple enemies just inside the entrance; it’s best to let them patrol past the front door and then shoot them with V.A.T.S. so they go down in one or two bursts. - Despite the size of this place there’s very little to see besides places to take cover, so once you’ve offed the opposition head for the far end of the ground floor. Catwalks and stairways will force you upward. There’s a door ahead with an Advanced lock, and to the left of it a string of offices. Inside the last one is a Novice terminal that will activate a Protectron. If you couldn’t get through the Advanced door you can go up to the top floor here and cross the middle to reach the other half of the Ironworks; we’ll go that way. - There are enemies here who will potentially spot you from an adjacent office, so move carefully. Your destination is the upper northwest set of stairs in the area, across a makeshift bridge from the office on the upper floor. There are Forged on the lower floor whom you can ignore completely if you’re quiet, though they may shoot you down if you’re not. Watch out for a Turret in the northwest, watching the bridge. (Check the terminal in the office while you’re there, as well. It’s horrifying… especially for poor Yancy.) There are Workbenches in the office and a Power Armor Station up by the Turret. - At the top you’ll find two doors. The one up the stairs leads back outside, though it’s got an Expert lock attached. You’ll find a few more Forged up here, but they’re not guarding anything terribly lucrative. (Though one of them was so badly glitched that he didn’t know what to do when he saw me besides stretch his arms out and stare. Was totally worth the trip.) The other door leads to a new area, as well as a boss fight. Be ready to heal. 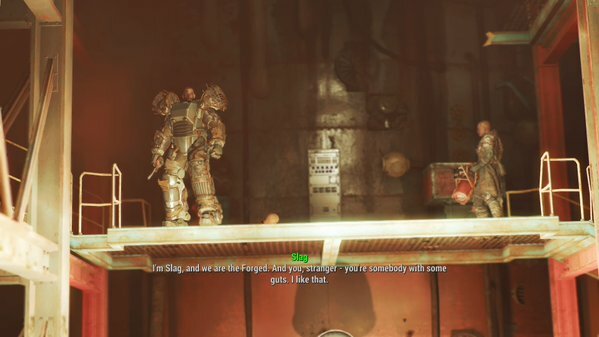 Slag, leader of the Forged in Fallout 4. Upon entering this area you’ll hit a cut scene where you meet Slag, the lovely leader of the Forged. He’s trying to force Jake to prove himself by killing a Settler. You can either egg Jake on and get into a fight with him and the rest, or, if you’re persuasive enough, you can convince Jake not to follow through. Mentioning his family will make it a bit easier. He’ll then join your side in fighting Slag. Either way, a battle’s a-brewin’. This is not an easy fight unless you’re way overlevelled. Slag is accompanied by three other henchmen (four, if Jake isn’t convinced) and will spend the fight shooting you with a laser from his perch while his buddies take you on below. Start by shooting the guy up and to your right, hiding on the upper level, then take out the melee dude who rushes you. Jake comes next if he’s not on your side. That done, get behind cover and use the catwalks to stay out of Slag’s sight while you take out his final friend. Heal as necessary. Now for Slag. He’s decked out in almost full Power Armor and is incredibly tough to kill. 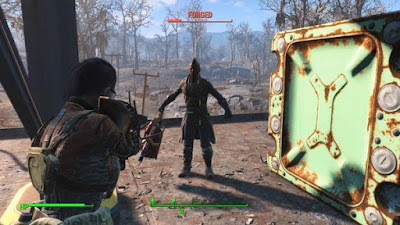 If you have Jake this part’s nevertheless fairly easy, as he’ll grab a Flamer and engage Slag, allowing you to stand off to one side and shoot Slag in the head, the only part of him that’s not protected. Slag is fairly stationary, so aiming isn’t a big deal. If you’re by yourself, keep moving around to avoid his laser, wait for him to pause between bursts, and aim / use V.A.T.S. to target his bald cranium. He’ll go down eventually. - Once Slag and company are dead, check Slag’s corpse for the Shishkebab, the sword he stole. (Don’t worry if he fell in the molten metal beside his platform, he won’t sink. For… some reason.) You can also find a trunk full of cool stuff on his platform, and there’s an Explosive Bobblehead on a panel near the trunk. Last, check down the stairs to the right of the platform and you’ll find a hatch that you can open to receive a Dampening Coil. - If Jake survived, speak to him; if not, now’s the time to leave. Return to the Farm, potentially listen to some squabbling, and receive your reward. (Yep, you keep the sword. Glee!) After this you can use the Farm as a settlement. Return to Preston for your experience. you say it's tough unless you are over leveled, what would over leveled be for this quest? lvl 30, lvl 50? I just did it at level 17. Lol, I got tire of fooling around, lv24, This battle had me breaking out the Fatman, aiming a mini nuke above Slags head blasts about half his life bar...just got to be careful to aim high, or the blast will blow Jake up too.